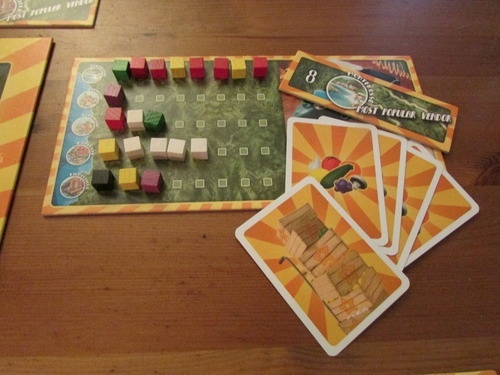 A quick little game that I had thrown into a trade recently is Tower of Babel. In Tower of Babel, you are attempting to earn the most victory points by helping to build (or offering to help build) the different wonders of the world. Each turn, the active player has two options - he can either select a building disc to build, or he can pass. If he passes, then he draws one cards and his turn is over. If he attempts to build a disc, then he selects which disc he wants, and all of his opponents can offer cards to help. When selecting which opponents' offers he will accept, a player cannot accept more cards than are required to build the disc. (For example, if the disc requires four white cards, he cannot accept an offer for three white cards and an offer for two white cards.) Whichever players are not selected to build get to keep their cards and also receive a victory point for each card offered. Whichever players are selected get to place a marker on the in-progress wonder for each card that they offered. Finally, the active player gets to keep the building disc. Alternatively, a player can, along with his offer, include his "trading" card. Of all of the players that offer a trading card, the active player can only accept one offer. If he accepts that offer, then he must discard a card from his hand for each card that the "trading" player offered. In addition, the "trading" player gets to keep the building disc - however, the active player gets to place markers on the wonder instead of the "trading" player. At the end of each building turn, all players get to draw a card. Once each wonder is completed, players are rewarded based on how much they have contributed. Additionally, at the end of the game, players are rewarded for how many building discs they have, and earn the most points by having matching types. Whoever has the most points at the end of the game is the winner! The first pro that I have for Tower of Babel is that it is one of the most uniquely strategic games that I have played. It really takes a full game before you start understanding how any of the strategy works. During that game, you will start trying to balance whether it is "better" to contribute to wonders, or to collect building discs. Or, do you want to try to make offers that you think that other players won't accept - thus earning victory points and keeping your cards. Really, though, you need to balance out all of these things. So, ultimately I think that the strategy of the game (along with what makes it unique) is in deciding how many cards to offer, and when to offer a trader. There are some situations where you don't want your offer to be accepted, yet can get a lot of points for making it - and so you need to capitalize. At other times, you will truly hope that your offer is accepted - either because you offered the trader for a building disc that you really want, or you are trying to get markers on a wonder right before it scores. I found these different elements to be very interesting. The second aspect of the pro that I mentioned happens when you are the active player. As the active player, you have most of the power when determining how victory points are going to be distributed. This is especially true if you are building the last disc on a wonder. When doing this, you get to see what everyone has offered, and based on those offers, you can often determine which player will score in each position on the wonder. There are really two ideal options in this situation - first, of course, is to put yourself into the best position, thus making the most points. The second option, though, is to force two other players to tie for first place - thus making them both only get points for second! Again, there really are a lot of elements to factor in when making decisions in this game. However, there are some cons with Tower of Babel that are worth mentioning. The first one is fairly trivial - the game includes some of the most useless playing pieces that I have ever seen. Each player is given a fairly sizable column marker, and this is the player's turn order marker. These are placed on the turn order track in clockwise order. At the end of each turn, you are supposed to move your marker to the back of the line, and shift everyone else's marker forward. But, turn order never changes, and you just take turns going in a circle, like almost every other game in the world. So, why do I need a turn order track for this? Short answer - there is absolutely no reason whatsoever that you need this. The second con for Tower of Babel is that, ultimately, the game feels like a "trick" or "gimmick" game. By this, I mean that the entire game is essentially one mechanic - how many cards do I offer, and, often, how do I offer them in the hopes of getting turned down. That is really the game. All of the scoring is based on this one mechanic. So, though the game functions well, if you don't love this mechanic, it will cause the game to grow stale very quickly. (Honestly, there are a lot of game that center around a single mechanic - like Ra, which centers around an auction mechanic, and which I really enjoy. So, this con will only bother you if the central mechanic isn't one that you thoroughly enjoy.) The first time that you play, the mechanic of offering cards and trying to get rejected is really innovative - but, as you keep playing the game, you realize that this mechanic is the game. So, if you love that mechanic, then you will love the game and get a lot of enjoyment out of it. But, if you don't like that, or you get tired of it, then you will be ready to move on fairly quickly. Overall, I give Tower of Babel a 7.0/10. I honestly enjoyed the game. However, I don't see myself looking for opportunities to play it more in the future. And, since the other people in my play group had similar sentiments - being willing to play if other people wanted to, but probably not asking for it to be brought out, I don't see this one getting much more play. If Tower of Babel sounds interesting, you might also check out Lost Cities, Quo Vadis, and Famiglia. 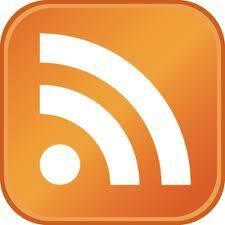 I would like to thank guest reviewer Jim Flemming for bringing us this review of Cinque Terre. 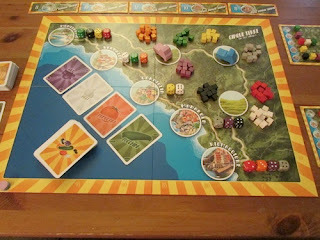 Cinque Terre is a recent release from Rio Grande Games and designer Chris Handy (the designer of Long Shot). 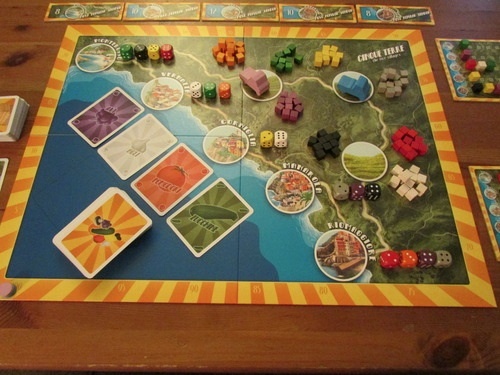 In the game, players are farmers, harvesting crops and selling produce to the five coastal villages in the Liguria region of Italy, or, the Cinque Terre. Players are represented by very nice wooden truck pieces that move around the 8 spaces of the colorful board. The goal of the game is to be the player who has gained the most money (VP) by game end. Pursuing this goal is relatively simple, as each turn, players have 3 actions to perform and 4 possibilities to choose from. Players can either move their truck up to 4 spaces, draw a card, harvest crops from a farm space, or sell produce to a village space. Set up for 2 players. The spaces of the board are laid out in a circle, with the 5 villages in a row, and the 3 farm spaces in a row between the first and last village. Players can move their truck up to 4 spaces in a clockwise direction. The four cards in the top row as well as the top card of the face down deck are available to be drawn by players. Produce cards are laid out á la Ticket to Ride, with 4 face up and the rest face down in a deck. Players can either draw a face up card, which is immediately replaced, or the top card of the deck. Players would earn 5 Lira (VP) for selling garlic (white) to Monterosa, or 2 for selling mushrooms (grey). The fourth action a player can take is to sell produce to a village. If a player’s truck is in a village space, she can sell any number of produce cubes from her truck to the village. When selling produce, the player puts any cubes sold on her player board in the row of the village she sold to. She immediately receives Lira (VP) on the score track equal to the demand for the produce she sold. Some villages will value certain produce more than others. This is represented by the colored dice next to each village. Players place produce cubes they have sold on their player boards in order to keep track of what produce they have sold to each village. Additionally, if a player is the first to sell 8 produce to any village, she will score bonus points as that village’s Most Popular Vendor. She will collect that village’s MPV tile, and score as many Lira as is pictured. If this player was the first to sell 8 produce to Monterosso or Corniglia, she would receive the MPV tiles for those villages. Players will be able to get a good number of points from simply delivering produce that is highly valued by certain villages, however there is a much better way to score Lira in Cinque Terre. A number of order cards equal to the number of players will be laid face up next to the board. These can be claimed by any player at the end of her turn, if she has fulfilled the requirements. So, for example, if after taking her three actions, Rachael has delivered at least 1 orange to Monterosso and 1 lemon to Riomaggiore, she can claim the shown card for 8 points. The game ends when 1 player has collected 5 public order cards in front of herself, all of the Most Popular Vendor tiles have been taken, or if two types of crops have been completely taken from their fields. Players then score all of their private order cards. Any private orders they are not able to fulfill score negative 5 Lira for every piece of produce they are missing. The player with the most Lira wins! Pros: Cinque Terre has a lot going for it. First, the components and the art are beautiful. I really enjoy how vibrant the colors are. The quality of the components is also very high. The cardstock used is one of my favorites - high quality, thick, and very easy to read. The wooden trucks are great as well, though they would’ve been nicer if they were more capable of holding four cubes in their beds (as they are, the cubes often fall out) - not a big deal, but it would’ve made a great component excellent. The presence of the public order cards really adds a fantastic level of tension to the game. After claiming a public order card, a player then has an interesting choice. She draws and looks at the top card of the order deck, then decides whether she wants to keep it as a private order card which will score at the end of the game, or use it to replace the order card she took at the end of her turn. THEN, she can either choose to draw the next order card and be forced to keep it, or simply not draw. In traditional Euro fashion, there is no way to directly attack your opponents, but a player who is able to be more efficient with her actions (and who may get a bit luckier with card draw) will have opportunities to grab order cards out from under her opponents, and really screwing them. I also really like the dynamic scoring balance that Mr. Handy has established here. Players are able to score big by going for the order cards. But players could also concentrate on simply delivering high valued produce to the same villages over and over again, attempting to get some MPV tiles and end the game before the other players can fulfill enough orders to win. Cons: Like any game with cards, there may be a few game sessions where one or two players have really good or poor luck when drawing their cards. The problem is that while drawing the wrong crop card is mitigated (two matching crops can be used as one of any crop), drawing the right crop card is much more efficient. Another place this comes into play is when players draw new order cards. A player could, especially later in the game, draw an order card that she already has completed. These lucky situations are inevitable and what make the game worth playing more than once. 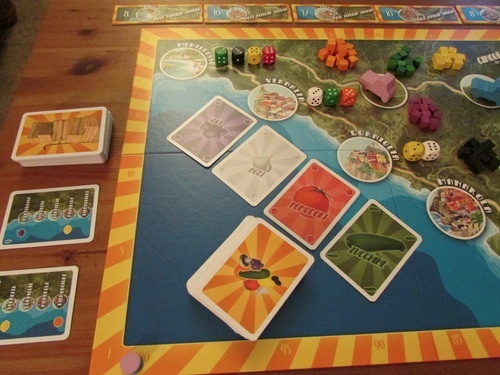 A comparison between Cinque Terre and Ticket to Ride is easy to make. They both use the same card drawing mechanism and both allow players to score during play but also reward players for fulfilling prescribed conditions (tickets/orders). I think that both games are wonderful, but I think that Cinque Terre makes a much better candidate for “gateway game.” Ticket to Ride is fun, and easy to explain, but I’ve thought for a long time that it does not introduce very many new concepts to a player who has not played many “modern” board games. To me, TtR is rummy with a board. Cinque Terre, on the other hand, not only has set collection, but also pickup and deliver, (at least) two fairly distinct paths to victory, action points, public goals, and a dash of push your luck. There is something to be said for TtR’s stripped down approach, but shouldn’t a “gateway” game give new players not only a taste of something new, but also a “tutorial” of sorts on new concepts that are out there in the wide world of gaming? 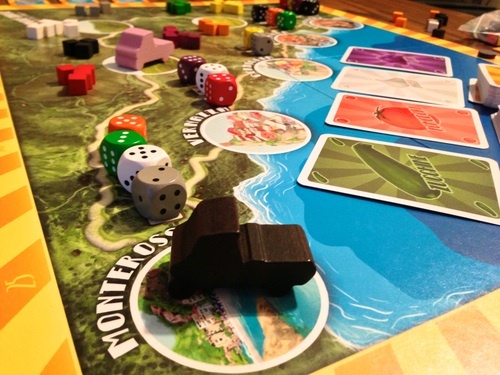 I think that Cinque Terre is simple enough for everyone to enjoy, but also complex enough to whet some players’ appetites for more. I would give Cinque Terre a solid 7.5. It is a lovely game whose beauty and simplicity belie the gorgeous depth and delicious cut-throatedness that lies in wait. It is being added to the very short list of games that I would both play with my wife or my gaming group and also feel confident about bringing to either of our parents’ homes to play with them. If Cinque Terre sounds fun, you might also check out Village, Pantheon, and Orbit Rocket Race 5000. 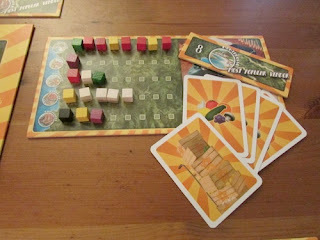 Board Game Reviews by Josh would like to thank Rio Grande Games for providing a review copy of Cinque Terre. A lot of games come out every year. And, often, the only games that you hear about are the latest releases. This is for a variety of reasons - publishers looking for advertisement, reviewers having already played the older titles, and the human tendency to want new things. But, with talking so often about new games, there is a good chance that there are some amazing older games that you haven't tried out. So, here are my top ten games that I think are worth going back and trying out if you haven't already! If you have fond memories of playing Risk with family, then this game is definitely one that you should check out. Taking the basics of Risk, 2210 adds a guaranteed end time (you only play 5 turns) while adding many strategic elements. It includes commanders that roll eight-sided dice, cards, and territories on the moon and in the oceans. This was one of the games that got me started in this gaming hobby, and it continues to hold a high place in my collection. Before Fantasy Flight Games came out with Battlestar Galactica, Shadows Over Camelot was the traitor game. (At least in my opinion.) With a shorter game time, but still much of the intrigue of Fantasy Flight's game, Shadows still deserves it's spot on your gaming table. If you haven't played this one and you enjoy games with a potential traitor element, then I recommend you check it out. 8. Hey, That's My Fish! This is the only children's game on my list. Why? Because I don't have kids! Yet, Hey, That's My Fish! transcends being a kid friendly game, and manages to be one that is enjoyable by all ages. This game will be regularly brought to my game night, and is almost always enjoyed by those who learns it. 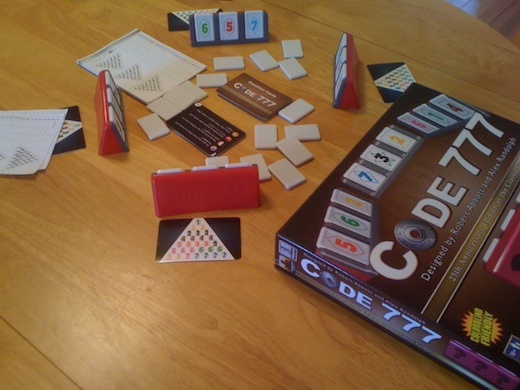 Before Hanabi won Game of the Year, Code 777 used a similar formula of showing everyone else what is in your hand, without being able to see it yourself. Yet, Code 777 takes a competitive approach, and forces you to deduce what you have as quickly as possible - without missing it - because that forces you to start over! If you like deduction, then Code 777 is definitely for you. The oldest game on this list (by a landslide) is Conspiracy. I picked this one up at a Garage Sale a few years ago, and I was very pleasantly surprised! Essentially, as a spy master, you are attempting to bribe various spies to move a briefcase (full of secrets, obviously) to your headquarters. But, the trick is that everyone else can move the same spies! And, ultimately, they will list to whoever (secretly) paid them the most! I'm not advocating that you run out and immediately try to buy this on eBay (unless it's cheap - I haven't looked at prices), but this is definitely one to keep an eye out for. The party game that combines party elements and strategic choices, is Liar's Dice (also known as Perudo). Recently, Liar's Dice was featured in one of Disney's Pirates of the Caribbean movies, and thus it got a bit more notoriety. 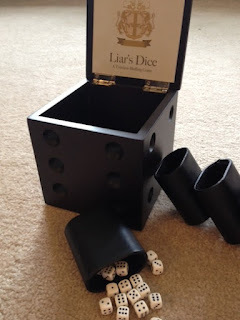 If you are looking for a game that can support a variable number of players, and that anyone can enjoy, regardless of how many games they have played, then Liar's Dice is a great choice. And, if you need to add more players, you simply have to find a handful of dice! 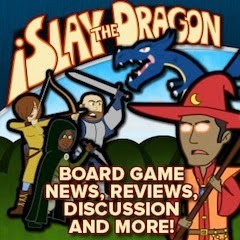 Stefan Feld has become a very popular (as well as prolific) game designer recently. In the last few years, he has put out what seems to be a dozen or more titles, with a new one always on the way. Yet, I think that some of his best work was on his earlier titles. In the Year of the Dragon forces you to balance decisions based on gaining points with decisions based on keeping your workers alive. 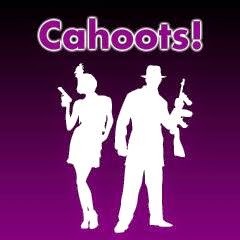 This game just recently slipped out of the BoardGameGeek top 100, but I think that it deserves to be returned to its place of prominence. It is always hard for me to figure out how to rank abstract strategy games against other, more thematic, titles. I almost created this list without including any. Yet, upon further reflection, I determined that abstract strategy games are overlooked at least as often as these other titles. And, Dvonn maintains it's hold as my favorite abstract strategy game. If you're looking for an interesting way to be forced to outwit your opponent, Dvonn comes highly recommended. The game on this list that has easily taken the most of my money is Game of Thrones LCG. As a note, I play this as a two player affair. (The living card game has rules for up to four - the original Collectible Card Game was a two player game). Regardless of if you enjoy the Game of Thrones books or TV show, the game itself stands on it's own as a strategic gem that forces players to balance what kind of challenges they want to make at any given time, and how they want to assign their forces. If you are not turned off by the continual release of new expansions, then this game is worth your time. When I had the idea for this top ten list, I already knew what the winner was. 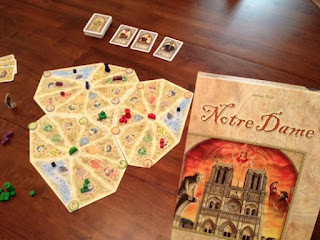 Notre Dame has recently slipped out of the top 100 games on BoardGameGeek, but I would put it in my personal top 10 favorites. This game forces you to adapt to what other players are doing, while also encouraging you to build on your own past efforts. It is a true gem, and if you haven't played it, then I encourage you to seek opportunities to do so as soon as possible. I had to pare down this list a bit before getting started. Part of the reason that I selected the 5 year time frame was to make my decisions a little bit easier (and I mentioned some of the quality games that were knocked off of the list by that requirement earlier). Yet, there are a few others that still deserve recognition while not quite making the top 10: Beowulf: The Legend, Pirate's Cove, and Tumblin Dice. Well, that's it. I'm sure that there are some great games that I've missed - quite likely because I haven't tried them! Feel free to recommend more games for me to check out in the comments! If you like top ten lists, you might also check out my Top Ten Two-Player Games, Top Ten Lunch Games, and my Top Ten Abstract Strategy Games. A game that I received as a sweetener in a math trade recently is Ninja Versus Ninja. In Ninja Versus Ninja, each player takes on the role of a feuding dojo. In order to prove yourself against your rival dojo (you can tell they are rivals because they wear different colors of the exact same outfit), you are attempting to sneak into their dojo as far as you can, and then sneak back out. Each turn, you will roll two four-sided dice, and this determines your movement for the turn. On each turn, you are only allowed to make a single 90 degree turn. You also cannot move through other ninjas. However, if you are in your opponent's dojo, then you are also allowed to make a single "U" turn by moving towards the far end of their dojo and then immediately turning around and moving towards your own. If you ever end your movement directly on an opponent's ninja, then you capture that ninja and remove it from the board. Finally, each ninja can only spend three turns outside of his home dojo (after that, he has to use the bathroom, and he really hates public restrooms). If he isn't back to the home dojo at the end of the third turn, then he is captured. However, if he does make it back in time, then you score points based on how far you successfully infiltrated your opponent's dojo. The first person to score seven points (or knock out all of his opponent's ninjas) is the winner. The first pro for Ninja Versus Ninja is that it is a great game for kids. The ninjas are amazing looking, and the game itself is pretty simple. There are some strategic elements to it - like whether you want to move your ninjas in the way of your opponent's ninja in order to force them to use extra movement to get back across to their home dojo. But, the bulk of the game is a simple press your luck mechanic. So, whereas I think that very young children might not catch the strategic element of getting in the way of your opponent, I think that this can be played and enjoyed by kids of just about any age. In fact, I have played this game with a four year old, and I know that he was able to play it without any real problems. Unforunately, due to the simplistic nature of the game, I think that the real con for it is that there's simply not much there. If you are looking for a game to play with kids, then this is a great option. But, if you're looking for a game that can be played by both kids and parents where both parties will enjoy themselves, I don't think that this is a great choice. Somewhat like Uno, though I think a lot of kids will like this game, I just think that most parents will get tired of it quickly. Overall, there's not much to this review because there's not much to this game. I give it a 6.5/10, because I think that, as a game for kids to play, it will do quite well. However, as someone without kids, I will be moving this game out of my closet in the near future. If you're looking for kid's games, you might also check out Hey, That's My Fish!, The Big Fat Tomato Game, and City Square Off. The latest game in Matt Leacock's series of cooperative thrillers is Forbidden Desert. In Forbidden Desert, the players are all archeologist-types (think Indiana Jones), and are looking to discover an ancient, buried, "flying machine." (Which we now call airplanes, but, that's just being picky.) However, they crash landed in the middle of a sand storm. So, now they must find and rebuild the flying machine before they die of thirst! How this works in game terms is that each player gets to take four actions per turn. These actions can include any combination of movement, excavating an exposed tile, clearing sand off of a tile, and picking up a discovered part. At the end of their turn, a certain number of sandstorm cards will be flipped, and each of these cards will cause the board to shift and for sand to blow onto the moved tiles (alternatively, the cards can cause the adventurers to all lose ("drink," if you will) some water). If the players find all four parts of the ancient airplane and get to the runway in time, then they win. If they get buried in the desert (run out of sand tiles), succumb to thirst, or take too long, then they lose! My first pro for Forbidden Desert is that it has a very similar feel to his previous games (Forbidden Island and Pandemic) and yet truly stands on its own. To be very honest about the matter, I almost decided to take a pass on Forbidden Desert, because I was expecting it to just be a rethemed version of Forbidden Island. Fortunately, that is not the case. Obviously one of the biggest differences is the theme. But in the gameplay there are also a few major differences - specifically players are no longer drawing and matching cards (which was the crux of the past two games), and also the shifting board is a nice touch (similar to Forbidden Island's sinking tiles, but quite different). I am glad to see that the comfortable feel of Pandemic has been taken and molded into a new experience with Forbidden Desert. The next pro that I have for Forbidden Desert is that I like how players find the parts of the flying machine. Some of the tiles, when excavated, give clues as to a part's location. Specifically, there are two clues per part - one clue will give you the row for the part, and the other clue will give you the column. Thus, once you have found both clues, you may place the part on the board. (It then can shift around, but will stay on the tile that you "discovered" it on.) This is an interesting element, and I think that it fits well both thematically and mechanically. Though I was quite pleasantly surprised by Forbidden Desert, there are still a couple of cons that I will mention for the game. The first one is that Forbidden Desert still suffers from the "alpha player" problem. Basically, what this means is that if you play with a very opinionated player, it can turn into a game where one person is playing the game, and everyone else is simply taking the actions that this player is telling them to do. Yes, I realize that part of this is a problem with that player, and not necessarily with the game itself. Yet, there have been several cooperative games recently (Hanabi and The Lord of the Rings LCG come to mind) that have found ways of mitigating this problem. Forbidden Desert actually went the other way - the minor amounts of hidden information that were found in Forbidden Island and Pandemic (a player's hand) are no longer present in this one. 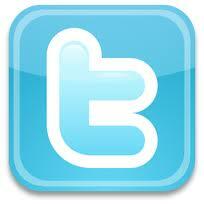 This time around, all information is public. 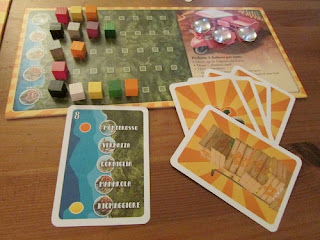 The other con that I have for Forbidden Desert is that it struck me as a bit more luck based than I would have liked. Now, I realize that any time that you play a game with a deck of cards, there will be a luck of the draw element. Yet, in Forbidden Desert, I had at least one game where the adventurers succumbed to thirst within the first 3-4 turns because all of the "Sun Beats Down" cards were stacked near the top of the deck. There are ways of avoiding losing water - Solar Shields and Tunnels. But, if the Sun Beats Down cards are at the top, then it is quite possible to have an adventurer (one of the ones that has a lower amount of starting water) die of thirst before you are able to successfully find either of these defenses. Additionally, there is a decent amount of luck around how the storm moves. Sometimes you will get a lot of "reprieves", where the tiles indicated can't actually move, and so nothing bad happens. Conversely, you might not get any reprieves, in which case you probably won't win. Overall, I give Forbidden Desert an 8.5/10. It was a very pleasant surprise for me. Whereas I was expecting to have a re-skinned version of one of my other games, I was happy to get an entirely new playing experience. My biggest complaint from my experience with the game is that FedEx beat up my game before it ever got to me - and that's definitely not the game's fault! 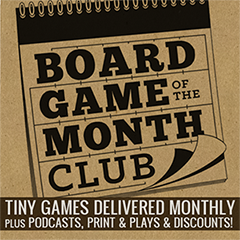 If Forbidden Desert sounds interesting, you should also check out Wok Star, Castle Panic, and Flash Point. I would like to thank GameWright for providing me with a review copy of Forbidden Desert.